This post appeared as comment piece in the Helensburgh Advertiser 15/08/13 in response to a comment that the town does little to celebrate the life of its most famous son, John Logie Baird, on the 125th Anniversary of his birth. Whilst it appears odd that there is so little tangible evidence within the town, celebrating the achievements of arguably its most famous son, the man generally regarded as almost single-handedly inventing the TV industry, it is understandable. I believe that many projects, including a dedicated John Logie Baird Centre, have been touted over the years yet none of them have materialised. I have no evidence of why this has been the case, but I would guess that the development of a viable, sustainable business case has been the main stumbling block. Such is the global significance of Logie Baird’s life that most of the surviving historic items associated with his achievements are held in national museum and university collections across the world and this makes it very difficult to find a suitably different angle which would attract funding. Many of ideas that would normally materialise, when considering official celebration of a life such as Baird’s already exist, for example Museums, TV Festivals, Awards for Innovation etc. Of course Helensburgh still boasts The Lodge, the house where Logie Baird was born and raised, but as this is a private residence in a quiet residential area, I doubt whether the current owners, and their neighbours, would welcome hordes of tourists turning up night and day to take photographs and demanding a guided tour. Should the house ever become available on the market at some future date, perhaps an institution such as the National Trust for Scotland might step in and purchase it for the Nation, in much the same way that Lennon and McCartney’s childhood homes were successfully acquired in England. If that were to happen, you would then have a truly relevant and unique point from which to stage a permanent celebration of Baird’s life. But to state Logie Baird’s achievements are not recognised within the town would be fundamentally wrong. We may not have formally celebrated the 125th anniversary of his birth earlier this week, but that does not mean that he is forgotten. Helensburgh Heritage Trust’s Centre in the library contains an excellent collection of items associated with Baird, including a working model of the Televisor, and regularly organises events and talks that concern aspects of his life. Likewise, the town that gave the world the man who pioneered Television also gave us the UK’s first broadband network of professionally operated, community owned hyper-local TV channels in the highly successful URTV. And of course we also wish to honour Baird’s achievements, along with many other inspirational people within our proposed Heroes Centre. Whilst we have been fortunate enough to have obtained several valuable and rare items associated with his life, including the World’s only surviving complete television sales catalogue from 1928, we wish to honour his memory and achievements by inspiring Helensburgh’s next generation of technology pioneers. If we can achieve this then I think we will have more than recognised the legacy that Baird, amongst others, left for this town. 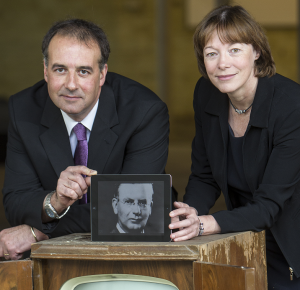 Image shows Phil Worms of Helensburgh Heroes, and Dr.Morag Ferguson, Glasgow Caledonian University, who recently announced a partnership between the two organisations to provide digital training at the proposed Heroes Centre in Helensburgh, with an image of John Logie Baird on an iPad.